All parameters of the Patrol 2x24 Night Vision Scope, beginning from light- weight, compact dimensions and finishing with perfect ergonomics, make this device ideal for long-time use in motion. 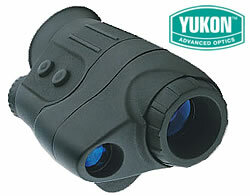 Wide-angle field of view makes observing dynamic objects easy and exciting. The device is equipped with an IR Flashlight for observing images when there are insufficient levels of natural illumination at night (no Moon and stars) or in complete darkness (in a fully isolated room, basement etc. ).